All of our safaris in Kenya are based on private departures - they are not group trips. This means the itinerary, transport and accommodation arrangements are made for you. The most important implications of this are that (1) the itineraries can be customised to meet your needs and (2) you can manage your own pace when you are on safari. PRIVATE ROAD SAFARIS - On a private mobile safari, you will have a dedicated naturalist driver guide and converted safari 4WD which is used both for transport around the country and for game drives within the reserves. 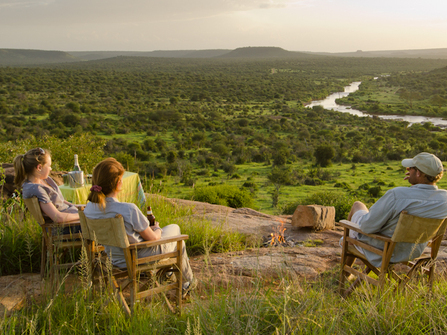 On the plus side, they tend to offer better value, there is a lot of flexibility to manage your own pace and we can show you a more grounded perspective of Kenya accessing some smaller parks and camps which don't have their own vehicles & guides (such as the Maji Moto Maasai Camp). On the negative side, accommodation is typically in more basic camps and mid range hotels and there are some longer road journeys to contend with. PRIVATE FLY-IN SAFARIS - Typically staying in higher end camps and lodges, transport around the country is by domestic flights. The camps offer a daily schedule of game drives and other activities with their own (very good) guides and vehicles. These are usually on a shared basis with other guests, but typically as a family of four people or more, you'll end up with you own dedicated guide / vehicle. On the plus side, camps are of a higher quality with greater attention to detail, ambience and exclusive locations away from other tourists. The camps also tend to be better bases for relaxing between activities (with swimming pools etc.) and travel times are lower. On the down side, it can be a lot more expensive, and harder to coordinate with some of the more down to earth experiences on offer in the country.